We tested a new semi-production bike from Mitch Pryor (MAP). This was a perfect excuse for us to embark on a “fast camping trip” to explore two “secret” passes in the Cascade Mountains. We encountered everything from fast pavement to terrain that is more suitable for mountain bikes. How does a lightweight 650B randonneur bike fare in such a diverse endeavor? Female cyclists often are overlooked, but randonneuring has included women from the earliest days. Raymond Henry protrays six female randonneuses and takes us on their amazing rides. Whether it’s a Diagonal in the 1930s or the Raid Pyrénéen during the 1960s, these women knew how to ride and how to have fun! We feature a Camille Daudon that was ridden by one of the women on René Herse’s team. She rode this lovely machine to many records in time trials and other events. The bike has survived exactly as she rode it, displaying a lovely patina. 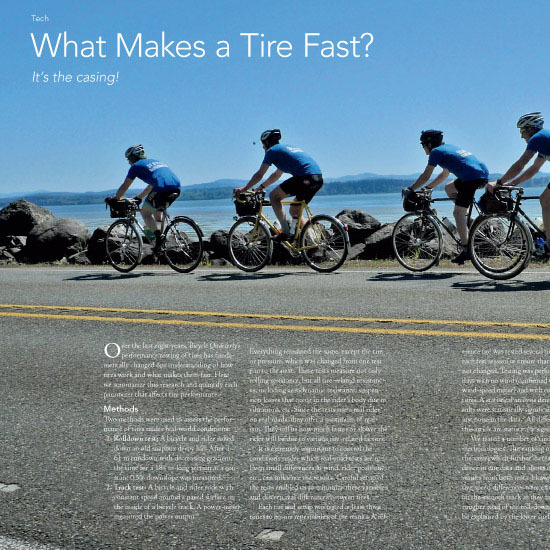 What makes a tire fast? How important is the width of your tires? The thickness of the tread? The tpi of the casing? The rubber compound of the tread? We quantify each variable, so you can choose the best tires for your upcoming season. A second article looks at how tire tread works, while a third explains why tire pressure does not matter when it comes to optimizing the performance of your bike. A new feature are our “First Rides,” which bring you a first impression of a new bike before we have the opportunity to do a full test. We rode the affordable Soma Grand Randonneur 650B bike for a few days and tell you how it performs. 54 What Makes a Tire Fast?